Sink and drain lines in food preparation areas are notorious for slow drainage and back-ups. 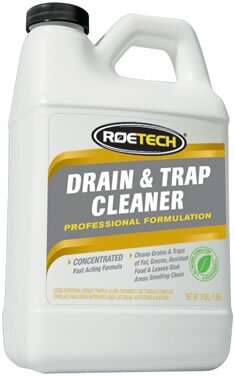 LDT is a safe and natural way to biologically clean your sink traps, floor drains, and other waste plumbing and to keep them free of organic debris, FOG, and other food particles which can be the cause of your drainage related issues. Formulated with patented ROETECH bacterial cultures, as well as a fresh odor neutralizing fragrance, LDC will not damage pipes, plumbing or other fixtures; is non-corrosive, and is safe for worker’s skin. Used regularly, LDC will increase sink line drainage and will decrease drain line odors. Apply to all kitchen sinks, floor drains and wash sinks regularly.